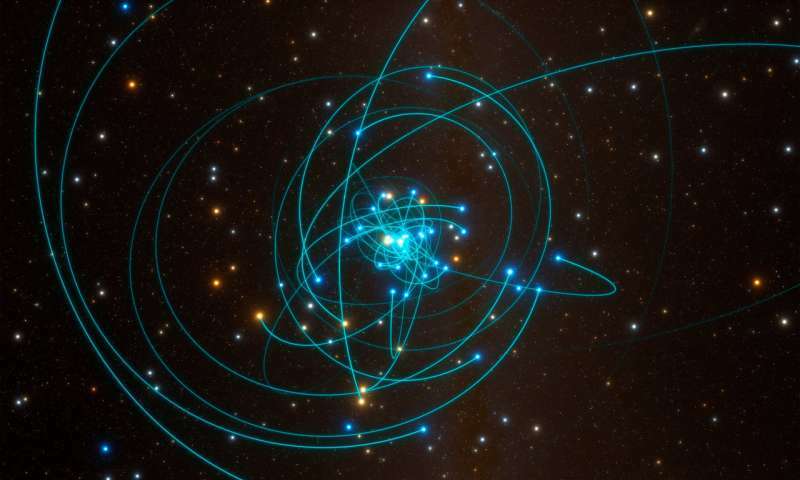 Observations made with ESO's Very Large Telescope have for the first time revealed the effects predicted by Einstein's general relativity on the motion of a star passing through the extreme gravitational field near the supermassive black hole in the centre of the Milky Way. This long-sought result represents the climax of a 26-year-long observation campaign using ESO's telescopes in Chile. Obscured by thick clouds of absorbing dust, the closest supermassive black hole to the Earth lies 26 000 light-years away at the centre of the Milky Way. This gravitational monster, which has a mass four million times that of the Sun, is surrounded by a small group of stars orbiting around it at high speed. This extreme environment—the strongest gravitational field in our galaxy—makes it the perfect place to explore gravitational physics, and particularly to test Einstein's general theory of relativity. New infrared observations from the exquisitely sensitive GRAVITY, SINFONI and NACO instruments on ESO's Very Large Telescope (VLT) have now allowed astronomers to follow one of these stars, called S2, as it passed very close to the black hole during May 2018. At the closest point this star was at a distance of less than 20 billion kilometres from the black hole and moving at a speed in excess of 25 million kilometres per hour—almost three percent of the speed of light. These extremely precise measurements were made by an international team led by Reinhard Genzel of the Max Planck Institute for Extraterrestrial Physics (MPE) in Garching, Germany, in conjunction with collaborators around the world, at the Paris Observatory–PSL, the Université Grenoble Alpes, CNRS, the Max Planck Institute for Astronomy, the University of Cologne, the Portuguese CENTRA – Centro de Astroﬁsica e Gravitação and ESO. The observations are the culmination of a 26-year series of ever-more-precise observations of the centre of the Milky Way using ESO instruments. "This is the second time that we have observed the close passage of S2 around the black hole in our galactic centre. But this time, because of much improved instrumentation, we were able to observe the star with unprecedented resolution," explains Genzel. "We have been preparing intensely for this event over several years, as we wanted to make the most of this unique opportunity to observe general relativistic effects." The new measurements clearly reveal an effect called gravitational redshift. Light from the star is stretched to longer wavelengths by the very strong gravitational field of the black hole. And the change in the wavelength of light from S2 agrees precisely with that predicted by Einstein's theory of general relativity. This is the first time that this deviation from the predictions of the simpler Newtonian theory of gravity has been observed in the motion of a star around a supermassive black hole. 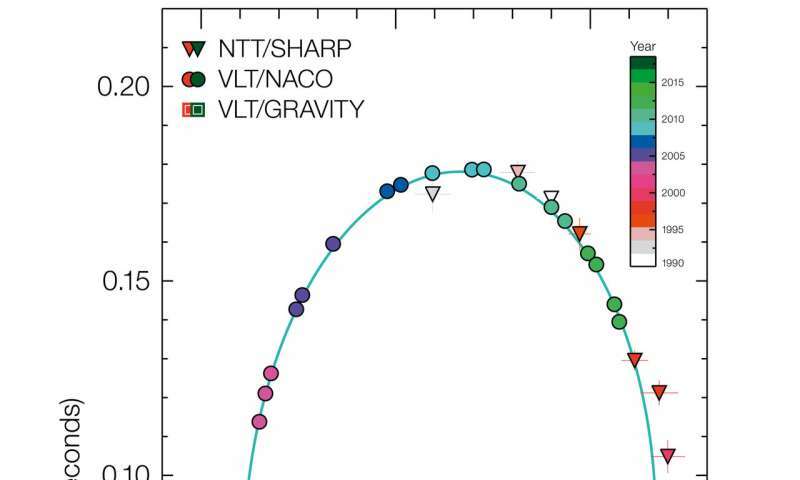 The team used SINFONI to measure the velocity of S2 towards and away from Earth and the GRAVITY instrument in the VLT Interferometer (VLTI) to make extraordinarily precise measurements of the changing position of S2 in order to define the shape of its orbit. GRAVITY creates such sharp images that it can reveal the motion of the star from night to night as it passes close to the black hole—26 000 light-years from Earth. "Our first observations of S2 with GRAVITY, about two years ago, already showed that we would have the ideal black hole laboratory," adds Frank Eisenhauer (MPE), Principal Investigator of GRAVITY and the SINFONI spectrograph. "During the close passage, we could even detect the faint glow around the black hole on most of the images, which allowed us to precisely follow the star on its orbit, ultimately leading to the detection of the gravitational redshift in the spectrum of S2." More than one hundred years after he published his paper setting out the equations of general relativity, Einstein has been proved right once more—in a much more extreme laboratory than he could have possibly imagined! Françoise Delplancke, head of the System Engineering Department at ESO, explains the significance of the observations: "Here in the Solar System we can only test the laws of physics now and under certain circumstances. So it's very important in astronomy to also check that those laws are still valid where the gravitational fields are very much stronger." 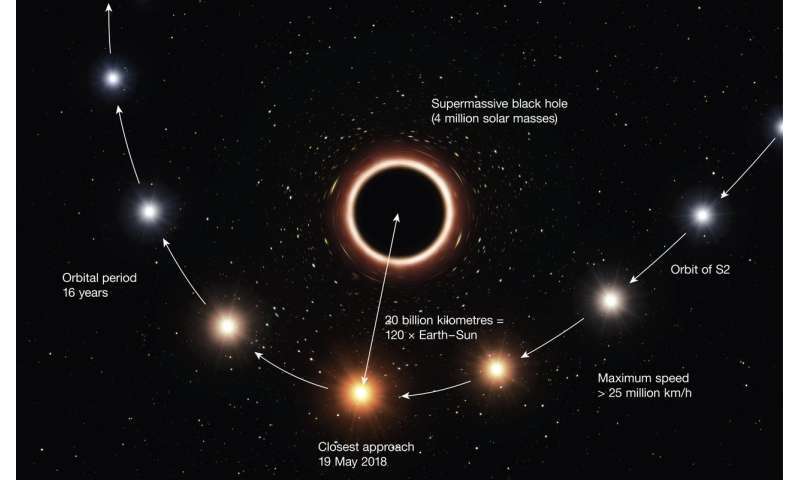 Continuing observations are expected to reveal another relativistic effect very soon—a small rotation of the star's orbit, known as Schwarzschild precession—as S2 moves away from the black hole. Xavier Barcons, ESO's Director General, concludes: "ESO has worked with Reinhard Genzel and his team and collaborators in the ESO Member States for over a quarter of a century. It was a huge challenge to develop the uniquely powerful instruments needed to make these very delicate measurements and to deploy them at the VLT in Paranal. The discovery announced today is the very exciting result of a remarkable partnership." So this puts the nail in the coffin for the "galactic barycenter" right? this being an effect of a gravity well on light as apposed to a common center of mass accounting for the motion of an object? Most of this is well above my head, but the abstract is quite clear. Thank you. "...the closest supermassive black hole to the Earth lies 26 000 light-years away at the centre of the Milky Way." gee. thanks a lot for letting us know. Is it too soon to head in the other direction? At ~20 Billion km from the BH at its closest point, racing at over 25Million km per hour - how many litres of liquid DihydrogenOxide can be served at a pub in one of S2s planets before everyone is falling down drunk? Jones would know the answer. The nail has been in the coffin. Where are the barycenter folks now? And before a certain poster chimes in on this thread and possibly responds to me. Yes, I studied differential equations at a university. Yes, I studied differential equations at a university. .........ah, but did you pass the course & still come here finding the immutable Inverse Square Law incomprehensible? applicable to observed galaxies, which are dominated in the center by the baryonic density. density profile in regions with significant baryon densities. This is the very next line in the quoted paper. It makes it sounds a lot less like it's *believed* to be there in greatest density or responsible for anything outside of simulations using only DM. - but stringy and loopy theorists would be possibly disappointed, because no other mainstream theories would expect some deviations from general relativity. I think that proponents of dark matter theories based on modification of general relativity theory would be also disappointed - the dark matter apparently avoids the center of galaxies, despite according to these theories its effect should be most pronounced there. This looks odd to me. First off, "loopy theorists" are not publishing any dynamics - cannot construct harmonic oscillators in "loop quantum gravity" so it is seldom seen as a serious alternative. String theory generically reproduce general relativity at large scales, so that is not relevant here. "Similarly, the older simulations suggested the concentration of dark matter should peak sharply at the very center of a halo. Yet the speeds of stars in nearby dwarf galaxies indicate that in their cores dark matter is spread out smoothly over a larger volume. The new simulations get that detail right because they capture how the gravitational effects of stars stir up the dark matter and spread it out. "Even if the stars are a small fraction of the mass, they really shake up the halo," Hopkins says. Perhaps the simulations' single biggest lesson so far is not that scientists need to revise their overarching theory of cosmology, but rather that problems lurk in their understanding of astrophysics at smaller scales." At the closest point this star was at a distance of less than 20 billion kilometres from the black hole and moving at a speed in excess of 25 million kilometres per hour—almost three percent of the speed of light. Wow! The star was moving at almost 3% of c? What would happen if it collided with another star moving in a very different direction? Wouldn't that produce one hell of a crash and a big explosion? Is there any evidence of any particular stars colliding at relativistic speeds? "Quora;-the stars in the Sagittarius A* region presumed to orbit a super massive black hole and not just the barycentre of the galaxy" - "Wikipedia:- Barycentre, the centre of mass of two or more bodies that are orbiting each other"
The motion of the galaxies seems more like a gravitic version of flow in a watershed than orbits about barycenters and such. Jesus, mate, just give up, yes? You are obviously not qualified in science of any sort, yes? Give it up, Granville; you are thick, as is easily shown. And has been. Just go do something that you are good at. Whatever that might be. Hard to think what it might be. English and Science are definitely off the table. Correct? What? Translate that into scientific English, you loon. Go away, you waster. Complete and utter ****pot. Correct? Look up the orbital parameters, you ****wit! Not difficult, is it? Burke? Stick to what you know, Granny. Whatever that might be. Actually its a nail in the coffin for general relativity. Results are being wrongly interpreted to suit relativity. How so? They just showed YET another apparent proof of general relativity. How do YOU say this result could be 'interpreted' to show general relativity wrong? This new evidence, like much previous evidence, very clearly contradicts the old Newtonian law of gravity (only for extreme conditions like this) while vindicates the law of gravity exactly as predicted by general Relativity. Relativity has been proven for a long time now. Relativity has been proven for a long time now. ...and, come to think of it, there has for so long been so much proof of it (both for special and general relativity), and no evidence to the contrary, that I am really puzzled why they keep trying to find YET MORE proof of it. The same goes for evolution. When one already has a vast mountain of evidence proving something, what's the point of forever adding more and more to that mountain? If vast mountain of evidence proving something doesn't convince someone, you really are completely wasting your time gathering yet more evidence because he will moronically simply dismiss it like all the other evidence before it. No matter how much evidence you show him, he will demand more. But we do know that there is a discrepancy between QM and GR, so something has to give at some point. The hope is always to find that effect and use it as a starting point for new physics where GR and QM can be integrated into one system. Evolution is a bit different. There's no discrepancy left to work out where it clashes with another system. The only thing left there is to cartograph how X evolved from Y and via what stages. Point taken. And, yes, now you mentioned it, I can see there is value in doing that. ...and, come to think of it, there has for so long been so much proof of it (both for special and general relativity), and no evidence to the contrary, that I am really puzzled why they keep trying to find YET MORE proof of it. Continue in doing that? because they are guilty conscious and are panicking, which is evident from these rapid succession of papers on GR. That's obviously false and completely absurd. Your are either totally delusional or a perpetual liar, I don't know which. But, either way, you will convince no one here. Go to his site. Read his 'papers'. It's delusional. No doubt about that. There's images of rotting fruit in there as "disprioof" of time dilation. And that's not even the most lludicrous one. I'm not kidding (oh how I wish I was). If he had written them in crayone it wouldn't be any more crazy. I didn't think anyone could be so delusional and I'm always thinking these stories from "deep in the heart of america" can only be fancyful fabrications. But...man...how can someone like that ever have learned how to breathe? not all us "deep in the heart" Americans is that crazy stupid! Yah, his pieces are pure therapist gold. How anyone can make their way in the world on that mental level is just beyond me. There must be an army of people helping him survive. let's just hope he also isn't hoarding plastic straws! Lol all you guys are stupid, not even intelligent enough to ask questions.